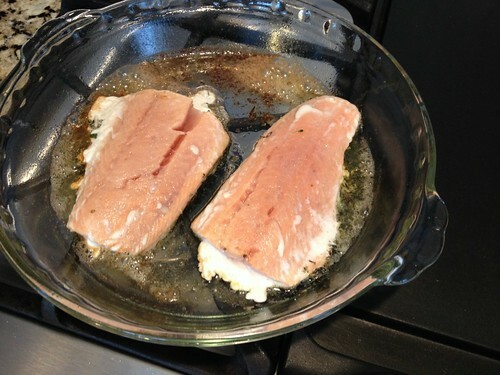 When it comes to cooking fish at home, Dave and I are FAR from experts. We have grilled salmon a few times before, and I have a super simple recipe for Lemon Garlic Tilapia — but that’s about it. I always kind of assumed that cooking fish inside would make our house smelly, or that it was too complicated, or even too expensive. Since fish isn’t necessarily my favorite protein, I started with salmon because I knew I liked it (and Dave likes most fish). I looked up a bunch of different recipes, watched YouTube videos about how to cook salmon at home, and waited for it to go on sale. I was able to get a package of 4 frozen salmon “tails” (not the best cut, but totally fine for us) for only $4.99 — so about $1.25 per 4-ounce portion! I didn’t really follow any specific recipe, but instead used the guidelines from some of the videos I watched. The results were WAY better than I expected — and it literally took longer to preheat our oven than it did to cook the salmon. 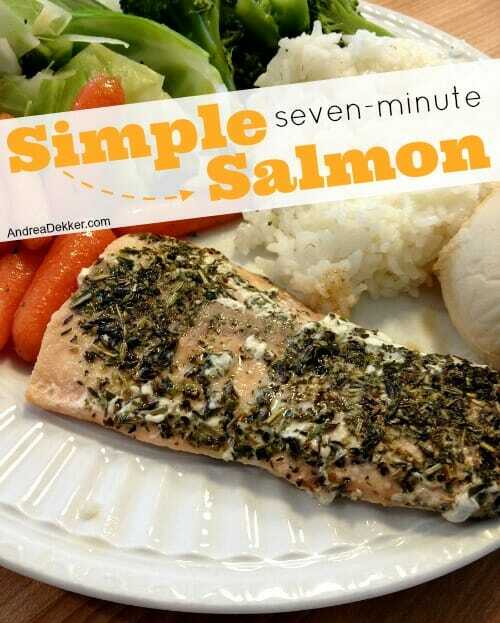 Dave and I were so impressed that I’ve made this “Seven-Minute Salmon” recipe a couple more times already — with amazing turnouts each time! 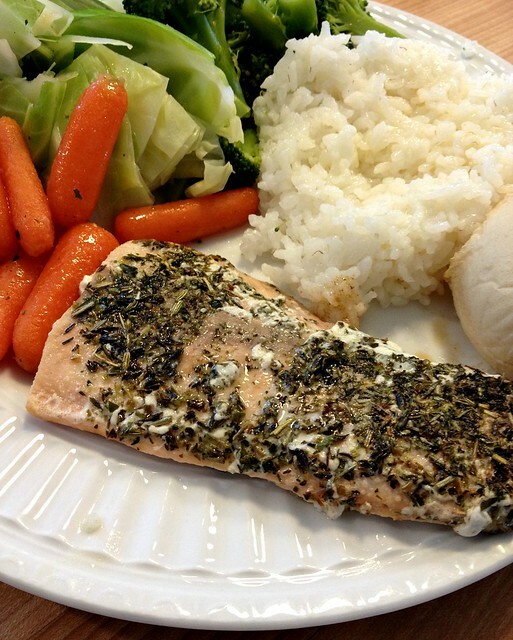 I serve our salmon with veggies, rice or pasta, and garlic bread or fresh rolls. 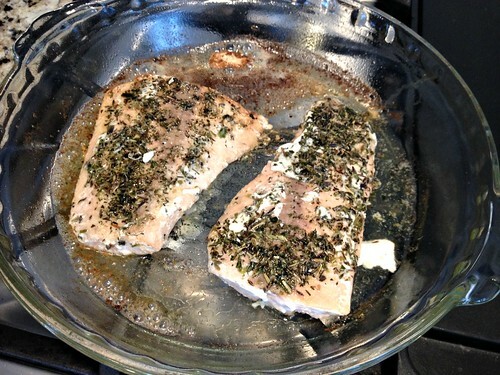 Obviously I’m not a salmon expert, but it has been pretty tasty each time I made it so far — and it’s just SOOO simple! It definitely makes you think how crazy it is to pay $30+ for salmon in restaurants! 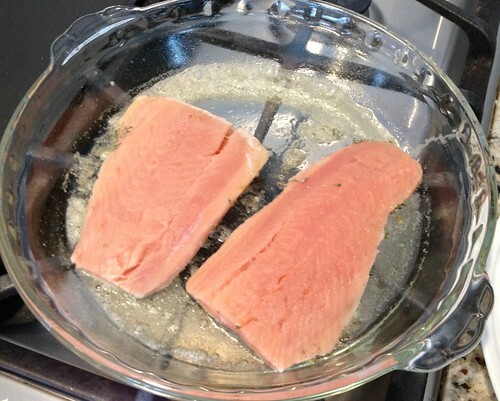 What are your favorite fish recipes to cook at home? Your salmon dish, amongst other previous post on things like when you got tons of fresh berries on discount to freeze, etc., just gave me a thought. If you wouldn’t mind sharing your wisdom – do you think you might be inspired to share what you know about when certain types of veggies/fruits/meat/fish would be in season, thus plentiful and yummy and cheap? thanks always for inspirational articles you provide! We’re going back to the west coast after 20years moving around, and I’m looking forward to shopping for local produce, fresh berries in season, etc! Your tip to look out for the store ads and website is very helpful, thanks! glad to help 🙂 Enjoy the est coast! Yes, I’ve seen lots of salmon recipes with Teriyaki sauce — but that’s not one of our favorite flavors so I’ve never tried that one either. Hope you like the simple butter + herbs recipe! You might want to have a look at Jack Monroe’s blog then. A Girl Called Jack. That looks delicious! 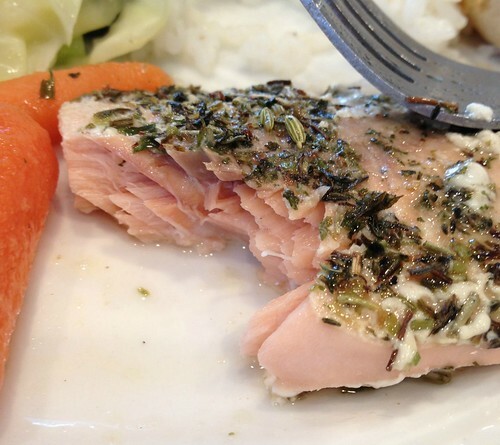 We love salmon; I may have to try this recipe. I would caution, though, about using a glass pan at such a high oven temperature. I don’t know whether all glass pans are the same, but I know that when I bake something using a high temperature, I have to use a different pan because my glass pans are only oven safe to a lower temperature, or they could break or shatter. 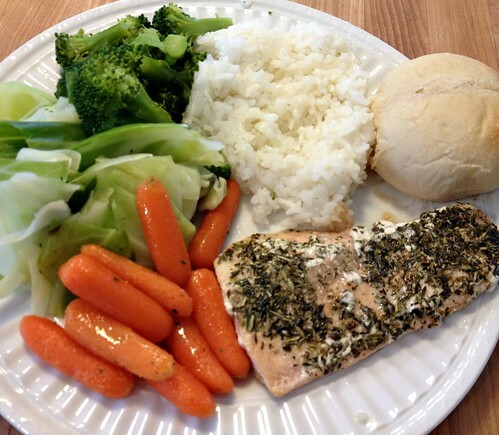 Love salmon!! !Thank you for the recipe!!! That sounds super yummy! Love how easy it is. 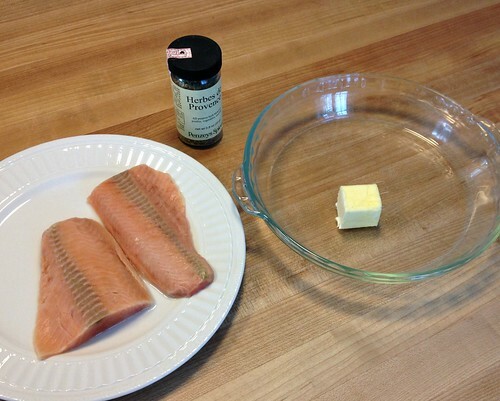 Our favorite fish recipe (and the only one my kids will eat) is this Salmon Rub my mother in law found years ago. I usually triple the dry ingredients so if our filet is bigger we have enough. I keep leftover rub in a sealed container. 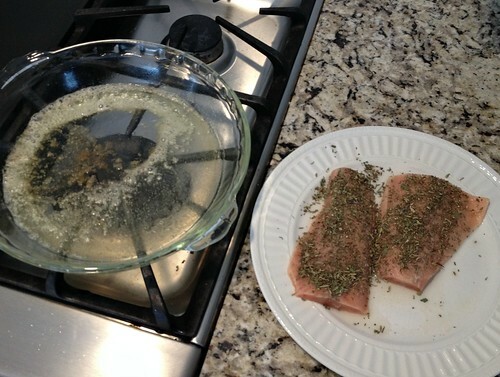 Rub Salmon filet with olive oil, sprinkle as much rub on filet as desired (we rub a bunch on). Grill or bake and enjoy! well Salmon has been MAJORLY on sale at the stores by me the last several weeks so if you ever want to try salmon, now is the time!